Seeing that The Story Of The Treasure Seekers was being republished by Hesperus Press made me very happy indeed. They’ve produced a beautiful copy, one that is almost edible with its quality and production values. You can see a larger picture of it here. It’s very lovely and also features a foreword from Julia “Gruffalo” Donaldson. E Nesbit herself was a bit amazing and in this, her first children’s book, she created something quite special. The Story Of The Reasure Seekers is about how the Bastable children try to restore the family fortunes. Narrated by one of the children who attempts to remain anonymous (though s/he gives himself away very swiftly! ), it remains surprisingly readable and enjoyable. Bearing in mind it was first published in 1899, this is quite something and shows just how good E Nesbit was. And she was! This is no run of the mill story. It’s full of a witty and precise skewering of standards and society, plus some very sharp commentary on religion, money and gender. Have a look at the clergyman incident for one example of Nesbit being amazing. I enjoyed this a lot. There were moments where it dragged a little, but this is reflective of its style and structure. It’s a book that would reward being read out loud due to the episodic nature of the chapters and the way these are very self-contained pieces. One thing to note however is that the text, being very much a product of its pre-twentieth century period, does feature one mention of the ‘n-word’. It is a singularly brief mention right at the end and could easily be skipped were you reading this out loud. I was struck on the rereading of this at how relevant it still feels and whilst that’s partially a sad testament to the currant financial climate, it is also a testament to Nesbit’s enduring skill. The Story Of The Treasure Seekers is something quite special, and this edition is an excellent way to introduce you to one of the eternal greats of British children’s literature. Also, you may be interested in this brilliant piece that reviews The Story Of the Treasure Seekers from the perspective of capitalism. I like the pretty books. I’ll glare pointedly at anyone who calls e-books the death of literature (because, you know, they’re not), but I do love a book that is as edible as this. 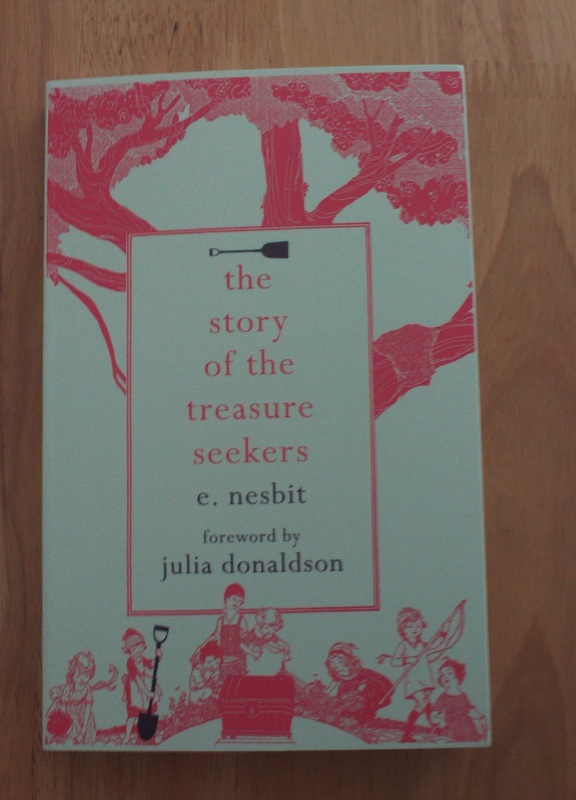 This is a reprint of The Story Of The Treasure Seekers by the great and wondrous E Nesbit. It has a foreword in by Julia “Gruffalo” Donaldson and it’s published by Hesperus Press (Twitter). Review coming soon … once I stop drooling at that front cover! I’m on a bit of a classics kick recently. And as mentioned in my review of For Love Of A Horse, these aren’t the Oliver Twist sort of classics. These are classics that have framed my childhood – and my adulthood – and are just really, really good. I love The Railway Children. (And I love Bobbie in particular. )E Nesbit is a stylish, approachable author who writes with a sort of seditious aplomb. There’s a whole level of this book that I missed first time round, the subtle comments on society, class and gender that quietly slip, slip, slide throughout the book. Have a look at how Nesbit writes her girls for example, the shift between Roberta and Bobbie, Phil and Phyllis, and the way Nesbit quite beautifully starts to fall in love with her characters. You should so read E Nesbit. You should read everything of hers because it’s all very, very gorgeous. It’s writing that’s full of riches; of families fighting and making up and falling in love and holding fast to each other against the world. And Nesbit writes that, she writes it all brilliantly, but she also rips it all apart. This is a single parent family, run by Mother in Father’s absence. And due to that absence, she becomes the breadwinner, the caregiver, and the authority in the lives of her children. It’s an apparently simple conceit but it’s one that allows Nesbit to quietly pull the rug from under our feet and shatter any preconceptions we may have. Girls are brave, boys are foolish, boys are brave and girls are foolish, and at the mercy of adult authority and yet, subtly, quietly, often manipulating and controlling that authority. It’s great, clever stuff that is still an excellent read over one hundred years later. I love Nesbit. I love her a lot. Read this, then go read The Phoenix and the Carpet, and Five Children and It and The Story of the Treasure Seekers and then read everything else she ever wrote. The Railway Children is available for free on Project Gutenberghere. (And for more on the subversive nature of the book itself, read this which is excellent. One of my favourite characters in children’s literature is Roberta (Bobby) from The Railway Children. The Railway Children, originally serialised in 1905 and published in book form in 1906, is a fascinating novel. And God, but Bobby is just a perfect perfect creation. She’s introduced as Roberta which is then swiftly changed into the derivative form of Bobby. In my edition of 267 pages, she is known as Roberta for 29 pages and then referred to as Bobbie for the rest save for a brief interlude of three pages upon her birthday where both names are used interchangeably. I find Bobby so massively appealing because of how the character is represented. She is growing up and she is unsure as to who / what she is meant to be. One way this is expressed in the novel, is through Bobbie’s wish to be a boy. A notable moment for this is the moment where she’s stuck in the tunnel with Jim, the injured ‘hound’. Bobbie, left in the darkness, addresses herself thusly: “‘Silly little girl!’ said Roberta to Bobbie and felt better (218). It’s fascinating the way she splits herself into two personas, the more feminine Roberta and the masculine Bobbie. Note here how the ‘feminine’ side of her addresses the ‘masculine’ side of her with a deliberately scornful comment. There is another key moment for me with Bobbie and it is when she sees the Russian cry. Bobbie acts firstly in a in a masculine manner by offering him her handkerchief – a direct parallel to Peter’s actions to Phyllis earlier in the text. The man gives the woman their handkerchief. However this gesture is also reminiscent of a mother giving her child her handkerchief. Therefore she acts in both a masculine manner and also a feminine manner – at the same time. Bobbie is a striking mixture of gendered characteristics and also old/young characteristics. She does not comment on the man crying nor bring this to public attention (showing a particularly adult form of social awareness and empathy). Instead she blocks him from public view and allows him time to recover. However when she is explaining the situation to the Doctor who smiles, she says, “’please don’t. You wouldn’t if you’d seen him. I never saw a man cry before. You don’t know what it’s like.’” (95) It’s an incredibly poignant episode and one where Bobbie shifts from adult to child, from girl to boy, from mother to daughter, all at once. And I think that’s what I love about Bobbie. She’s such a complicated character and one of the few representations of girls growing up that struck me as incredibly astute. The Railway Children is deceptively deep. I read it first when I was very young and when I reread it recently I was struck at how stunningly sharp it is. It is perceptive and it is anarchic in a very subtle way. It is, to be frank, brilliant and has an ending that leaves me weeping each and every time. 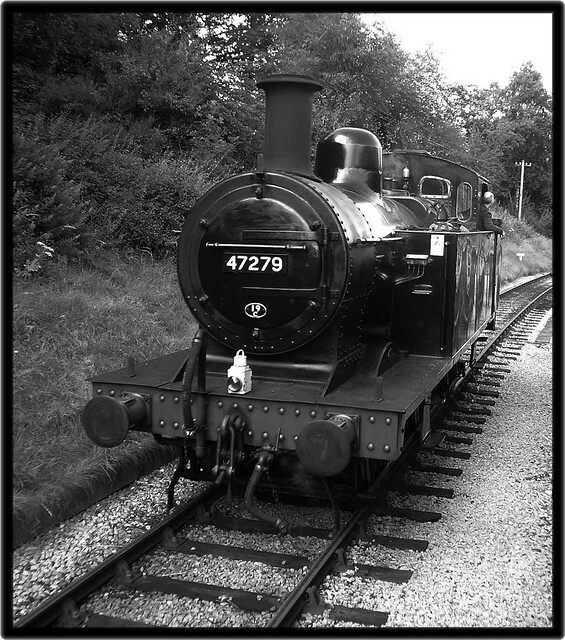 The Railway Children is available for free on Project Gutenberg. Jacqueline Wilson to update Five Children and It? According to this, Jacqueline (ignore the typo in the Tweet, it’s from the Grauniad) Wilson will be “updating” Five Children and It – the fabulous classic from E Nesbit. As I posted on Twitter, this news leaves me with very mixed feelings. E Nesbit’s work sparks of a very particular vintage and is just lovely. It’s also brilliant. Jacqueline Wilson’s work also sparks of a very particular vintage; grittier yes but no less “good”. She’s one of the defining writers of our time for a reason. Fingers crossed this one works out.